~ Grassroots action on climate change and energy issues in Alaska. The pressure on Alaska's elected officials to conform to the Fossil Fuels Forever narrative is intense and it takes humongous courage to go against it. But that's what happened last week. In a largely symbolic act, Alaska's legislature passed a resolution calling upon the federal government to open oil and gas leasing in the coastal plain of the Arctic National Wildlife Refuge. 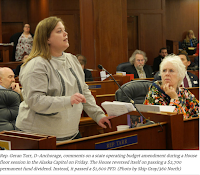 In the House, Rep. Sara Hanna (Juneau), Rep. Adam Wool, (Fairbanks), and Rep. Geran Tarr, (Anchorage) voted against it citing climate change impacts as their reason for opposition. Senators Tom Begich and Elvi Gray-Jackson also said no. Senator Begich's views on climate change are well known and he was joined by Gray-Jackson who stated she was unwilling to vote for the resolution without language calling for protection of northern caribou herds. These five state legislators, fewer than 1% of Alaska's elected officials, understand the gravity of climate change enough to just say no to expanding fossil fuel development. 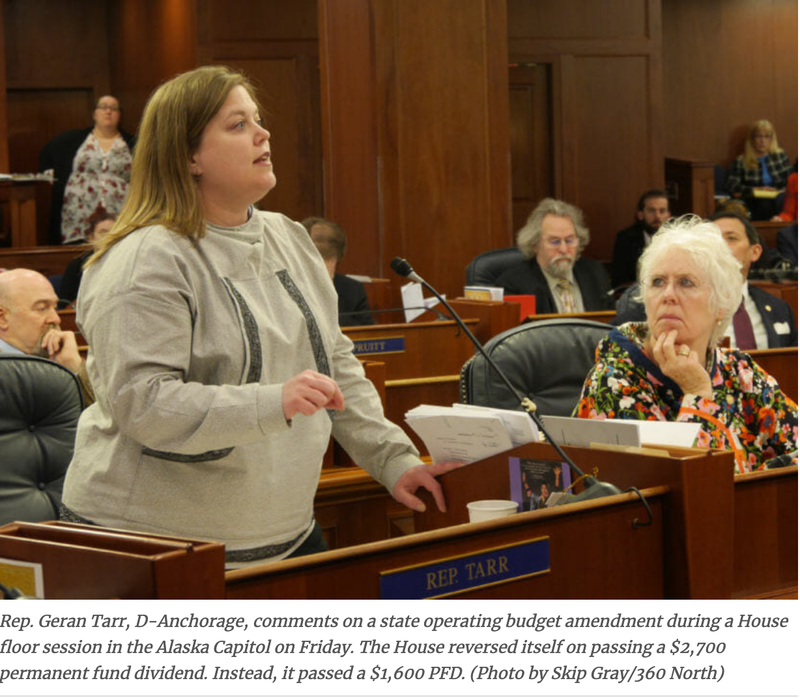 The conventional wisdom is that voting against the interests of the 'hand that feeds' can be fatal to political careers in Alaska (and indeed, in a fossil fuel funded rant, Rep. Tarr was publicly attacked for her vote). 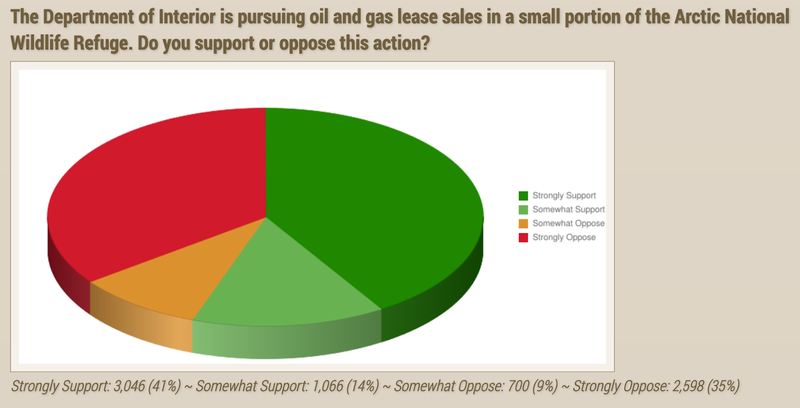 The Senate's own 2019 Web Poll, found that 35% of Alaskans "strongly oppose" and 9% "somewhat" oppose opening ANWR to oil and gas leasing compared to 41% and 14% respectively that support or somewhat support it (see the chart). Yet, only 1% had the chutzpah to vote with the people of Alaska. The signs are everywhere that we've reached a tipping point on public opinion on climate change. Extreme weather, emerging attribution climate science, bigger and stronger global climate protests (including Alaska), technology innovation and renewable energy market trends, state and local adoption of climate policy solutions are just a few. But the biggest catalyst of all was the UN Intergovernmental Panel on Climate Change (IPCC) report, released in December, giving humanity just over 10 years to avert catastrophic climate change. Extreme weather reports keep pouring in from Alaska's Front Line communities. Last fall the cold pool in the Bering Sea collapsed and for the second year in a row, they had no sea ice in the middle of winter. Patience is running thin. People are, rightfully, angry. These are signs the tide is turning, not only against our friends in coastal communities, but against their elected "leaders" who refuse, out of fear, vested interests, or dirty $ in their pockets, to stand up to Big Old Energy interests that keep Alaskans locked into a dying past. A landmark study by McGlade and Ekins found that globally, a third of known oil reserves, half of known gas reserves, 80% of current coal reserves and all unconventional and new fossil fuel -- including resources in the Arctic -- must remain unused if we are to avoid catastrophic climate disruption. In other words, the time has come for Alaska to let the fossil fuel spigot run its course, bump up our per barrel share and inject it into building a New Energy Future, starting with communities most dependent on oil revenue first. Difficult times call for great leadership. 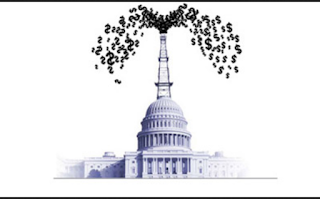 Representatives Hannan, Wool, Tarr, and Senators Begich and Gray-Jackson deserve our thanks. May they be the tip of a rising spear of political will sharp enough to induce real action on the Front Lines of climate change in 2020. · I’m speaking today on behalf of the Alaska Climate Action Network, a statewide grassroots network of scientists, policy and renewable energy experts, partner groups and Alaskans from all walks of life who are worried about the increasingly dangerous and costly impacts of climate change, especially in rural Alaska. · I would also like to thank the Commissioners French, Foerster and Seamount for granting this hearing in response to Kate Troll’s request and the 48 Alaskan’s who signed the petition at our Climate, Jobs & Justice rally in Anchorage on Sept 8th. · Since then, nearly 300 more Alaskan’s have joined in our appeal to the AOGCC Commission to do everything in your power to reduce Alaska’s GHG emissions (petition attached). o First, according to the 2018 Alaska Greenhouse Gas Emissions Inventory Report that “describes and quantifies human-caused sources of greenhouse gas (GHG) emissions occurring between 1990 and 2015 from Alaska operations and facilities” the oil and gas industry contributed an average of 52% of Alaska’s total GHG emissions equal to 44.5 million metric tons of carbon dioxide equivalents (MMT CO2e)/per year or a cumulative total of 552 million metric tons of carbon dioxide equivalents. § 1 Mcf at Ninilchik Falls Creek on July 1st, 2017. 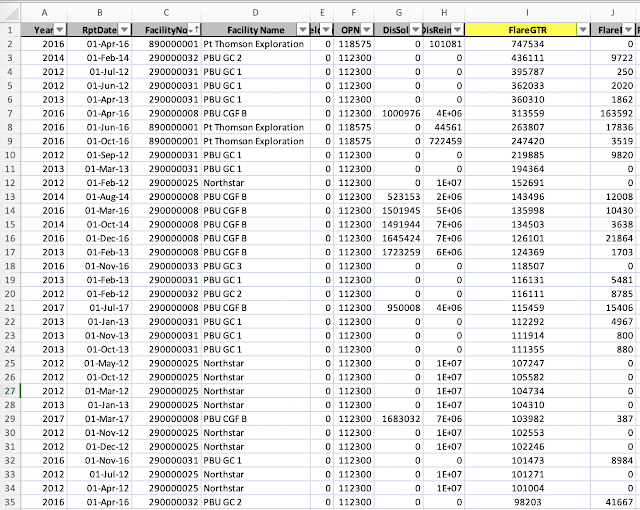 § 1 from PBU GC3 (see Table 1 below). *NOTE: 100K Mcf of gas = 5,509 metric tons of C02 or roughly the equivalent of adding 13.5 million cars/yr. to our highways. 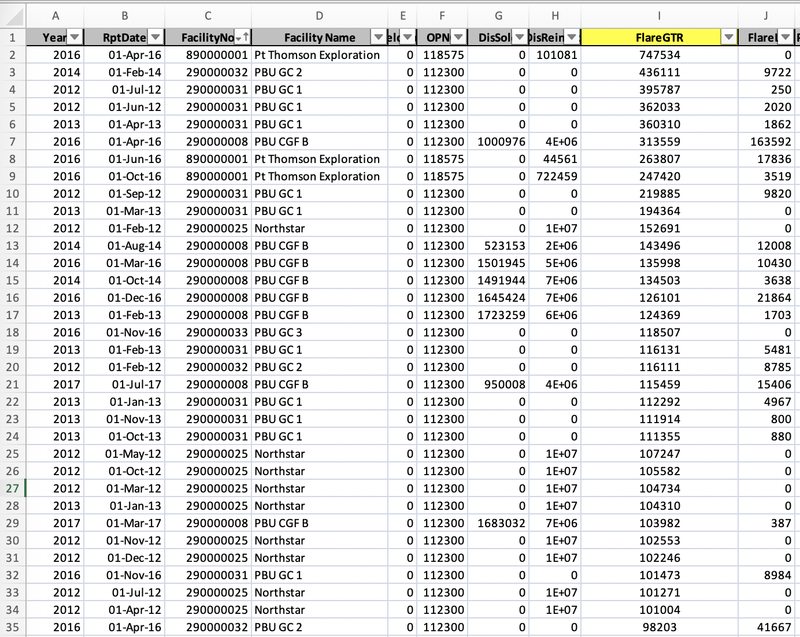 Table 1: Releases >100,000 Mcf of flared or vented gas, Jan 1, 2012 - Feb 1, 2017, from AOGCC data. 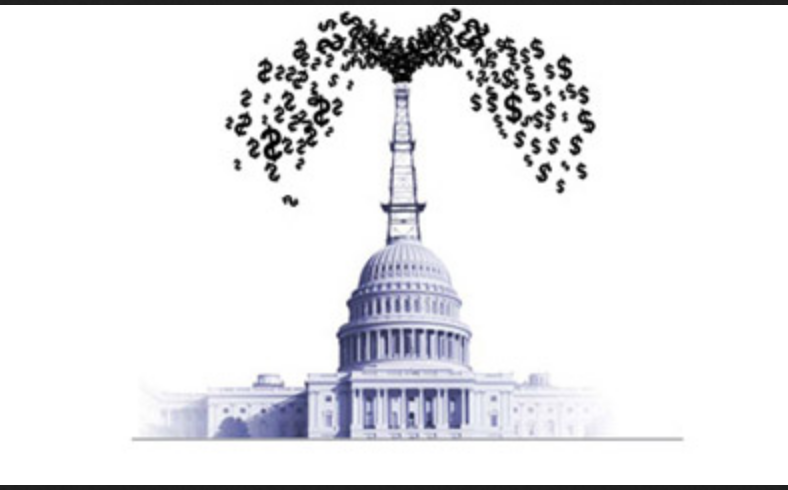 · Do these SUBSTANTIAL emissions fall under authorized emergency and normal operations and maintenance, or is something else going on? § In 2015, the industrial sector produced over half of Alaska’s GHG emissions. Fugitive methane contributed over 19% of the CO2e emitted by this sector in 2015. Most of the fugitive methane comes from oil production; a small portion comes from natural gas production. · Thus, how does the AOGCC track the more powerful methane GHG? We would very much appreciate answers to these questions! It’s important to note that these GHG emissions carry with them a whole suite of hazardous pollutants, including volatile organic compounds that have serious direct and indirect community and environmental health impacts, including cancer, neurological, developmental and reproductive effects and the capacity to disrupt critical endocrine hormones. In closing, as Bjorn Olsen with Alaskans Know Climate Change and I wrote in a recent OpEd (and it deserves repeating): “our civilization has little more than a decade to rein in greenhouse gas emissions or face a series of cascading ecosystem and economic collapses”. We urge you, as our duly appointed and trusted AOGCC commissioners, to do absolutely everything in your power to reduce waste, in the form of dangerous greenhouse gas emissions. We are the front lines of climate change; let’s get on the front lines of being the solution to climate change. The biggest emitters are the Prudhoe Bay Unit Gathering and Flow Stations, but Cook Inlet is also a significant contributor. “In 1970 alone, nine billion cubic feet of gas were flared from just one Cook Inlet oilfield, Granite Point,” “It was a huge amount of energy just going up in smoke,” recalls Norman, who is currently a Commissioner of the AOGCC. The public [then, as now] was solidly on the side of the Commission. The gas flares could be seen from Anchorage on a clear night, and they became symbols of what the public considered to be wasteful practices. In 1971, following extensive hearings, the Commission ordered an end to the wasteful flaring of gas produced along with oil from Cook Inlet platforms, except for what was needed for safety flares on the platforms. The Alaska Superior Court upheld the authority of the AOGCC in its action to prevent waste and (according to the 50-year “Our resources Our past Our future” report). The Commission's ban on gas flaring was extended to Prudhoe Bay when this giant North Slope field began production in 1977. Any gas flared after the order, except for the safety flare, was determined to constitute “waste” of the natural gas resource and was prohibited. “The companies didn’t want to stop flaring. They claimed there was no market for the gas and that it had no value.” But when forced to do so, the producers did find ways to use the gas beneficially. (b) Any release, burning, or escape into the air of gas other than incidental de minimis venting as authorized under (d)(4) of this section must be reported as flared or vented on the Facility Report of Produced Gas Disposition (Form 10-422). The operator shall submit a written supplement for any flaring or venting incident exceeding one hour. The supplement must describe why the gas was flared or vented, list the beginning and ending time of the flaring or venting, report the volume of gas flared or vented, and describe actions taken to comply with (c) of this section. (c) The operator shall take action in accordance with good oil field engineering practices and conservation purposes to minimize the volume of gas released, burned, or permitted to escape into the air. (6) upon application, the commission will, in its discretion, authorize the flaring or venting of gas for purposes of testing a well before regular production. (f) Notwithstanding conservation orders that the commission issued before 1/1/95, this section applies to flaring or venting of gas that occurs on or after 1/1/95. Get paid twice for saving energy in AK!